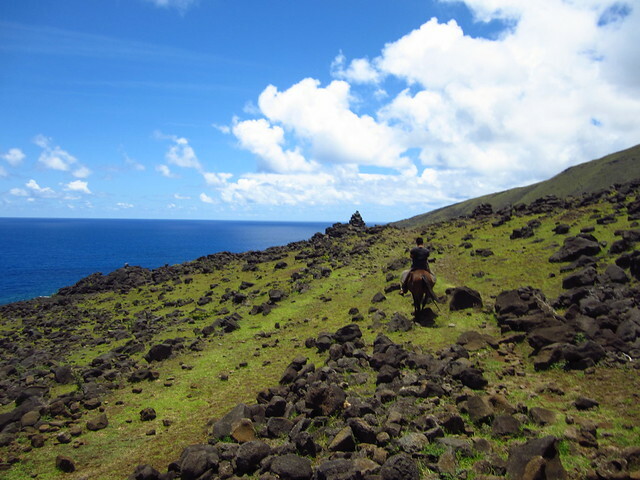 One of the things I planned to do on Rapa Nui was go horseback riding. Going riding again has been something I’ve wanted to do for years, and I hadn’t managed to make it happen until this trip. 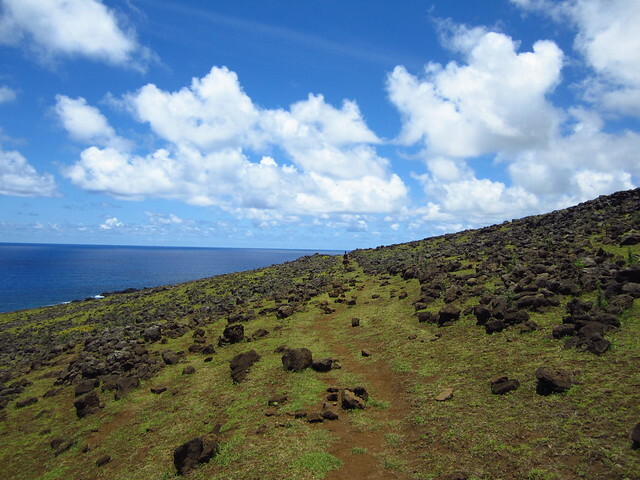 The north coast of Rapa Nui, beyond Ahu Tepeu, is only able to be covered on foot or on horse due to all the rocks covering the gorgeous landscape. 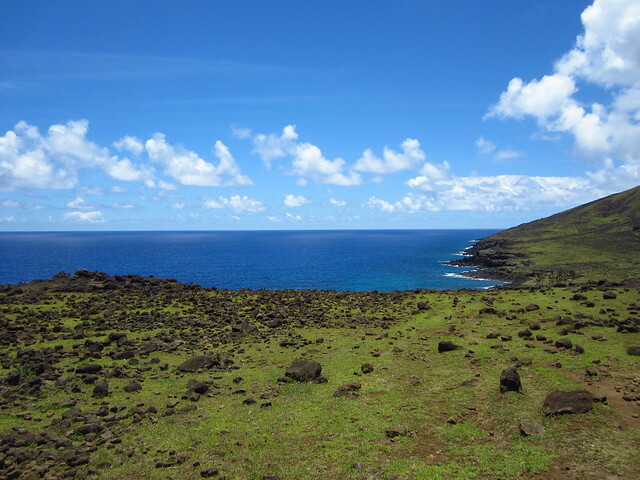 I knew I wanted to see as much of the island as possible, and so did my travel buddy, so we organized a guided ride along the north coast to Anakena. We got picked up early in the morning to head to the home/stable where our guides lived. As it turned out, our two guides were brothers who help out with the family business of riding and guiding when needed. They were amazing people and we started out the day laughing, sharing stories, and enjoying each other’s company. 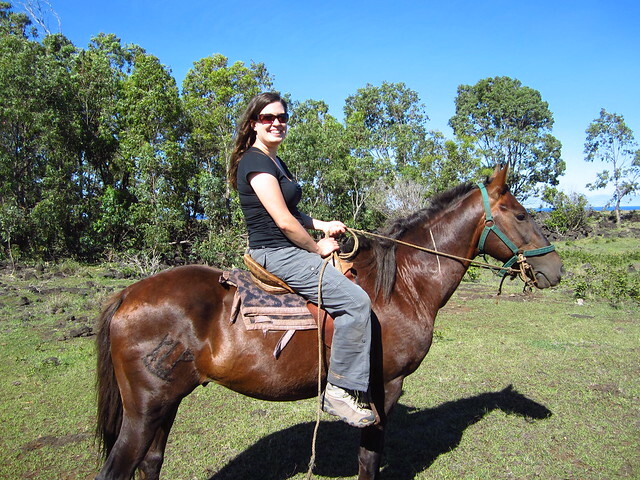 It was not your average, stale horseback tour; it was covering a long distance with new friends, seeing as much as possible, and letting things happen as they would. From the beginning, the landscape was amazing. 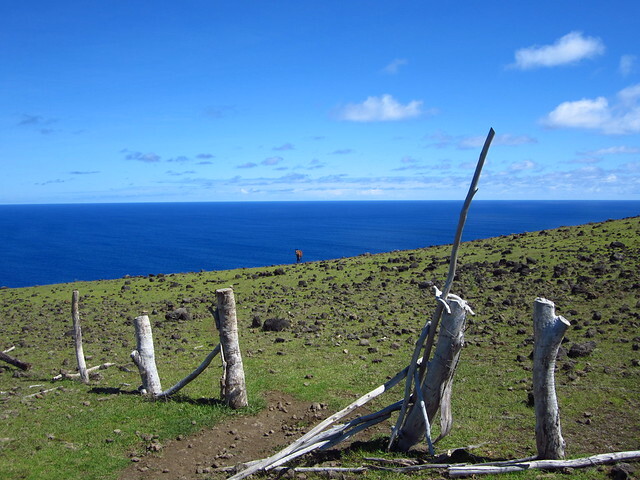 The skies were clear, the grass was green, and the sea was its ever-impressive shade of blue. The horses took their time on our way, and mine kept wanting to eat grass whenever I’d let him. Our guides told me that he’d been on vacation and was being a bit lazy. The benefit of being with guides, rather than covering this rather lengthy distance on foot, is that they know the land well, and they can point out some interesting things you might not spot otherwise. 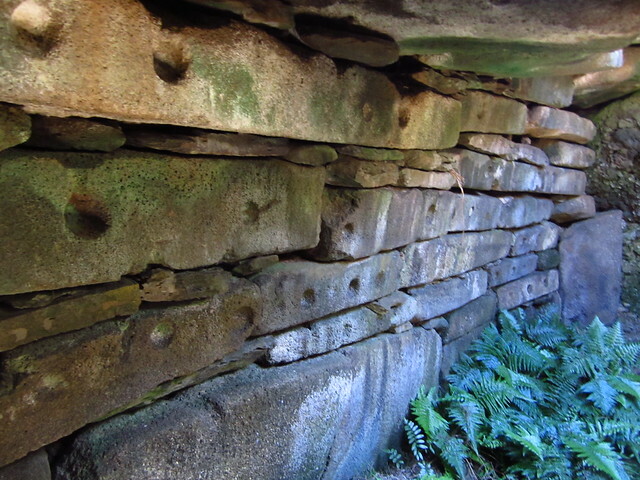 They showed us an old watering hole with a carving of a face, and while they couldn’t tell me much about it, I was glad to see it. We also passed countless boat houses, which you can recognize by their canoe shape; they were narrow structures which had been covered with bamboo when they were in use. And then there were the carvings we especially wanted to see; the moai. 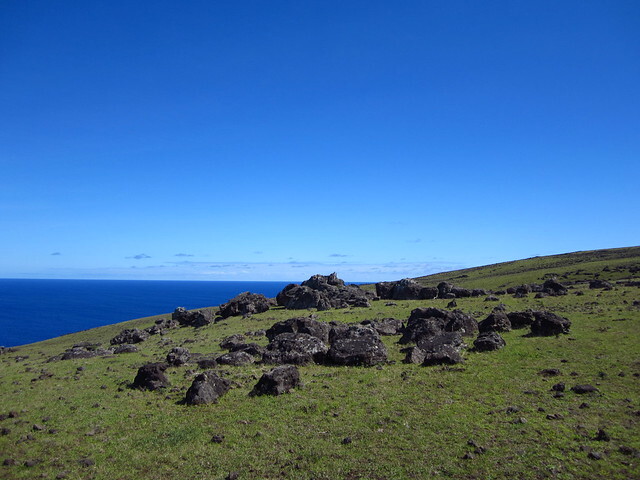 I am sure there are countless more moai than those they showed us on our route. 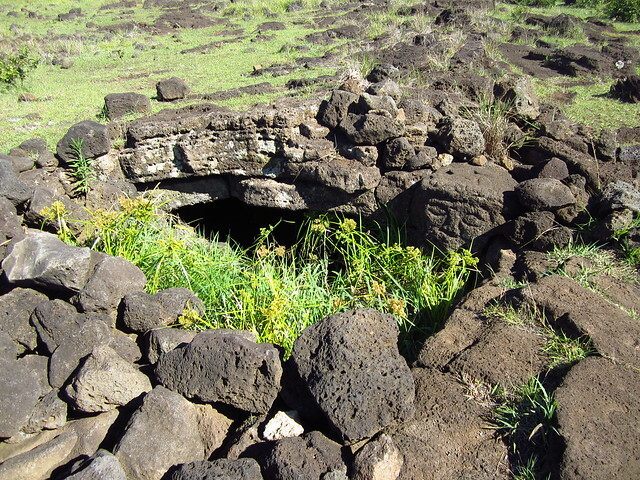 The abandoned ahu and fallen moai are just so common for Rapa Nui locals that they don’t think it that interesting to explore every location. 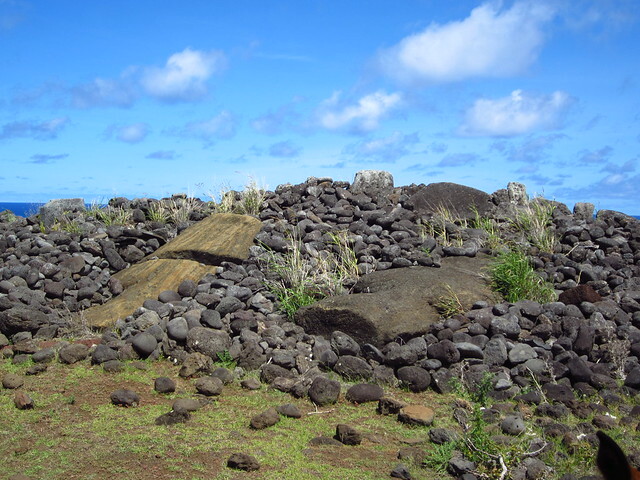 After seeing restored moai and larger sites with other fallen moai, it was interesting to just pass by these abandoned ahu with their moai sunken into the disarray of rocks. 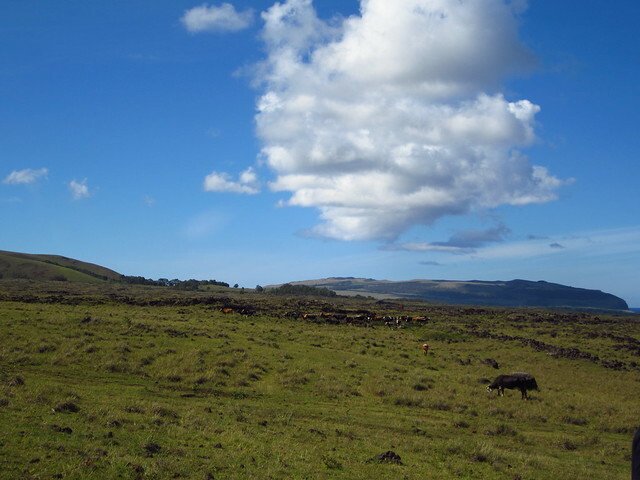 I wonder how much history has and can be studied there; questions to save for my return to the U.S. when I can read more books about Rapa Nui! 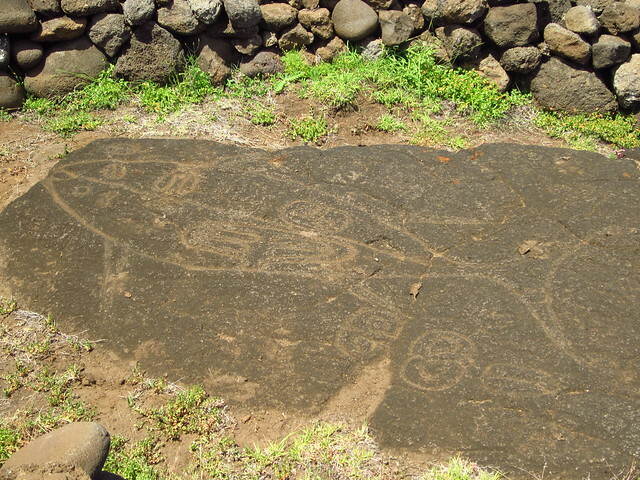 We also saw some rock art with marine images and the well-known make-make symbol. We saw more of the make make when our guides took us to a cave covered in carvings of the symbol. 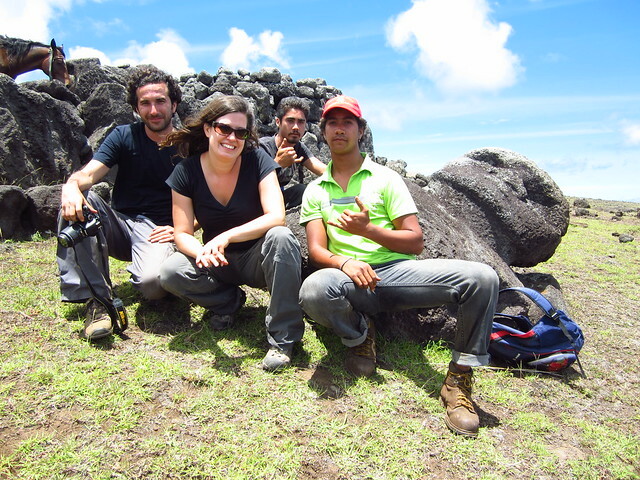 Our guides, along with another we encountered on our way, had to split up in order to find the cave. They knew the general area where they could find it, but they had to search to actually come across it again. It’s not marked in any way; you have to know where it is to see it. I would never have seen this impressive cave otherwise. 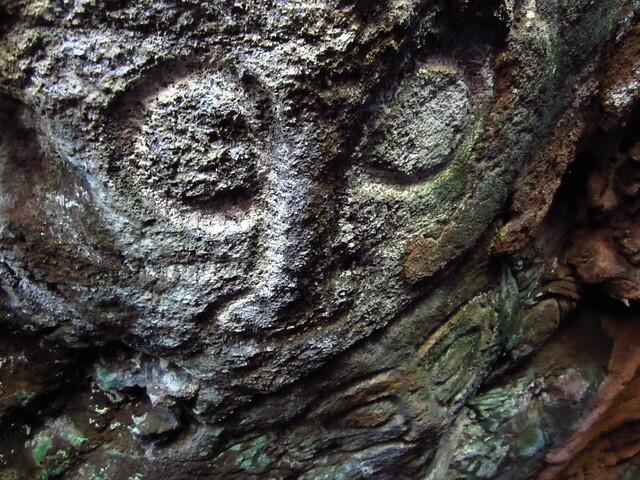 Once inside the cave, everywhere you looked, you saw images of make make, which represents the god of the birdman cult. It was fascinating and special to be so close to rock art that had meant so much to the earlier culture. As the guides said, this island is paradise. 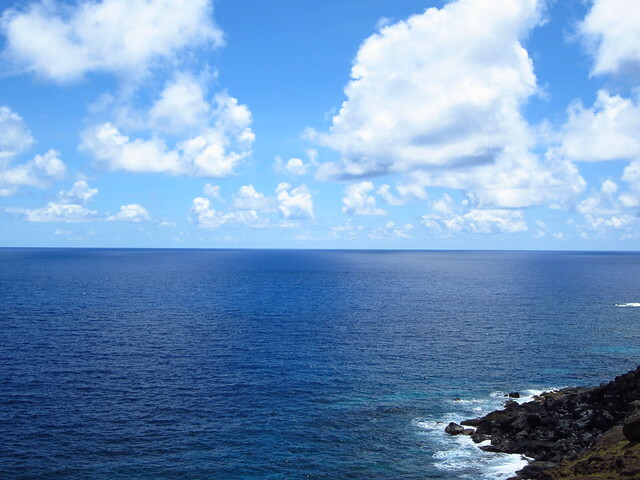 You just have to gaze off into the endless blue expanse of the ocean to appreciate it. Though the island’s past is incredibly troubled, the people have endured and appreciate their beautiful home. 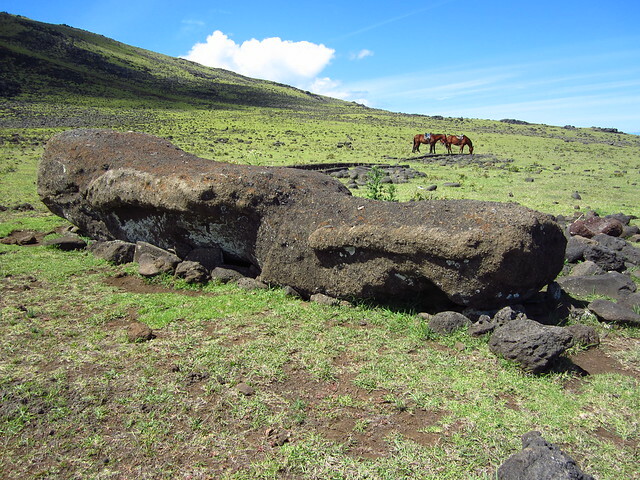 Our guides then took us to another fallen moai. They were intrigued by this one because of the differences in its features. Since it lays face-up, you can observe the broadness of its nose, suggesting a different race than many of the long-nosed moai. 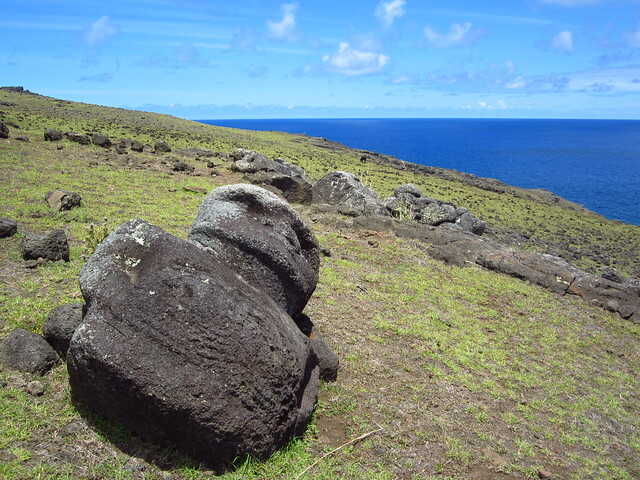 Moai were build to represent the ancestors, so this represented people with distinctive features. 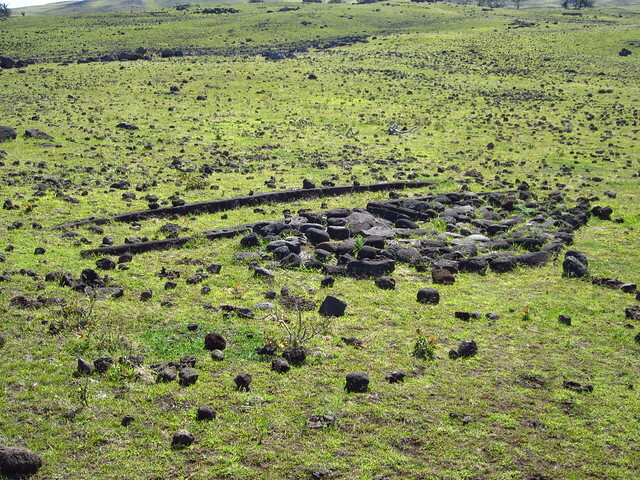 There are many questions about where the ancient Rapa Nui came from; this is just another mystery to ponder. We continued along the north coast, keeping the ocean at our left. The colors really were as amazing as they look in the pictures; it felt like you could film in technicolor there. The sun beat down on us, but we continued laughing, enjoying the journey, every moment a great one shared among new friends. As the saying goes, life is the journey, not the destination. And sometimes it takes special moments like this to remind us of it.